Pro-life Americans are applauding Gerber’s selection of a Down syndrome child for its 2018 “Spokesbaby of the Year” in a time when many unborn babies are aborted after being diagnosed with the condition. Lucas Warren, 18 months, was selected out of 140,000 photographs that were submitted to the popular baby food company’s annual cute baby contest. 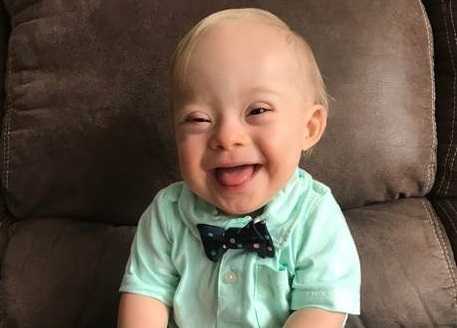 His parents state that they entered the contest on a whim, uploading to Instagram a photo they took of their smiling son wearing his church clothes—polka dot bow tie and all. “We got back home, and I thought he looked so adorable in the outfit, and I just decided to snap a quick picture of it,” Warren’s mother, Cortney, told PEOPLE. Gerber has held its spokesbaby contest since 2010, and this year marks the first that a Down syndrome child was selected. Lucas will be featured in Gerber’s social media campaigns throughout the year, and his family will receive $50,000, which will go toward Lucas’ education. The Warrens hope that their son will be a reminder that children with Down syndrome are bundles of love and joy who should no less be accepted in society. It is estimated that 80-90 percent of American mothers who receive a Down syndrome diagnosis choose to abort. Therefore, pro-lifers have applauded the selection of Warren as the Gerber spokesbaby in hopes that it might help change hearts and minds. “[W]hile most Americans may not yet take a consistently pro-life view, the vast majority rightly sense that Lucas Warren had every right to come into the world—and that the world is a happier place with him in it,” the editors of the Weekly Standard wrote on Feb. 8. “As a high-risk obstetrician for over 30 years, I’ve come to realize that despite the efforts of the National Down Syndrome Society and other groups working to raise awareness, there are still many people who don’t know what Down syndrome is. In order to keep moving in the direction of acceptance and understanding, it’s important that we continue to educate the public about these special children,” he said. The Warrens similarly state that they hope their son will help to provide encouragement to present and future parents of Down syndrome children.